One of the crew members aboard the International Space Station photographed this night view of storm clouds over Southern California. Early morning lightning can be seen as a white blotch just to the right of center. The yellow colored area, beneath the grey clouds, which almost shines because of night lights, is part of the highly populated area of Los Angeles and San Diego. This image was released July 21, 2013. Lightning as seen from the International Space Station, somewhere over Brazil. ESA astronaut Tim Peake tweeted this photo of lightning over South Africa taken from the ISS on Jan. 14, 2016. This image of lightning over Kuwait was taken by an astronaut aboard the International Space Station on Dec. 12, 2013. The Midwestern United States at night with Aurora Borealis is featured in this image photographed by an Expedition 29 crew member on the International Space Station. The night skies viewed from the space station are illuminated with light from many sources, including a small white patch of light is almost certainly lightning from a storm on the East coast (top right). This image was released Sept. 29, 2011. When passing over the Earth in darkness, astronauts aboard the International Space Station often see lightning flashes illuminating the clouds. 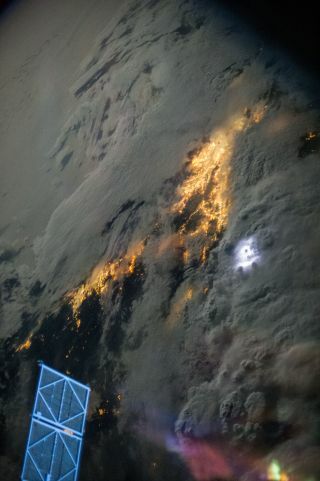 ESA astronaut André Kuipers captured this lightning flash on June 11, 2012. A strange type of lightning called a sprite that occurs above thunderstorms and extends to the edge of space was photographed by an astronaut aboard the space station on April 30th, 2012. Lightning in clouds at night is featured in this image photographed by an Expedition 7 crewmember onboard the International Space Station. This image was released Sept. 2, 2003. Italian astronaut Paolo Nespoli captured this image of night lightning on Earth as seen from the International Space Station on Dec. 30, 2010. One of the Expedition 30 crew members aboard the International Space Station photographed this nighttime image featuring a Lyrid meteor, just to the left of center. The space station was over the Gulf of Mexico, and many coastal cities in several states can be seen. Florida is above the center of the image with Cuba to the right. A line of thunderstorms had just passed Cuba when the photo was taken. The bright bluish blobs are clouds illuminated by lightning. This image was released April 22, 2013.